Fin-Nor has been around since the early 1930s when they produced their first reel that weighed in at a whopping 35 lbs, can you imagine? Since then they have gone on to refine manufacturing with lighter weight materials and excellent craftsmanship. 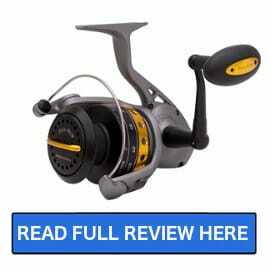 Many people are not familiar with the brand and that is to bad as they have some excellent reels on the market, like the Fin-Nor Lethal spinning reels. Fin-Nor is part of the Zebco family of fishing brands. The Fin-Nor Lethal is one of the most economically priced saltwater reels on the market today. The reels are available in sizes that are adequate to land everything from small trout and snapper all the way up to tuna, sailfish, and large tarpon.